2011年 香港 "When two phoenixes meet - Loo Sze Wong & Eri Ito"
Graduating from the Tokyo national University of Fine Arts and Music, Eri Ito’s mentors include Tadamaro Ono 多忠麿and Tadaaki Ono 多忠輝, who belong to a hereditary guild of orthodox musician serving the Japanese Imperial Court since the tenth century. Ito performs the sho and traditional gagaku dance at concert halls, historic temples and shrines. Besides being an ardent devotee of the 1200-year old tradition, Ito is also keen on exploring with Western ensembles and other Asian instruments, as well as premiering multimedia works. Ito’s performance includes; as a member of Tokyo Gakuso（東京楽所）: the 1st Anniversary concert of the Suntory Hall (1987), Gagaku concerts held by National Theatre in Japan (from 1987), Takemitsu Toru: Another world (1990, the National Theatre, in the presence of Japanese Emperor and Empress) Hida-Furukawa international Music Festival (1992), Tokyo Summer Festival in Suntory Hall (1994), AOI Concert Hall Shizuoka Opening Concert (1995), the 40th Anniversary Concert of the National Theatre “Bugaku Ho-e” (2006); as a member of Reigakusha (伶楽舎), UK tour (Birmingham, Cambridge, London, and Glasgow, 1998), Europe tour (Cologne, Berlin, Brussels, and Oslo, Ultima Oso Contemporary Music Festival) in 2000. Collaborative performance; Dream: Symphonic Stage (1999, the New National Theatre in Japan, joined the huge ensemble by Japanese traditional musical instruments and collaborated with choir, a Noh dancer, a Buddhist chanting group, Chinese dancers and a percussionist), Japanese Sound in Uehara (2001, Keyaki Hall, collaboration with Japanese biwa), Ito Eri Gagaku Concert (2009, Amuse Kashiwa, collaboration with piano, harp and other gagaku instruments). When the two phoenixes meet (2011, collaboration with Loo Sze Wang in Hong Kong University Concert Series). Over the Boundary (2012, collaborative work with Wuji ensemble in HK). In 2009, she produced her first CD in order to raise the charity for the hospice “Hope House”, which cares for homeless people. 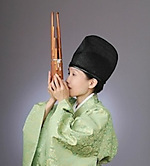 In the CD “Toward the Sea for Prayer” (2009), she reconstructed and recorded an ancient gagaku instrument, the u（竽）, which had vanished during the course of the history. Combining the recitation of prayers with the sho, u, piano, and a Balinese metallophone, the CD has successfully achieved to make the sound of sho more familiar to people. As such, Ito is carving a unique niche for not only the sho, but also for other traditional instruments in Japan, making them more accessible to all.